Home Agriculture canning pickles Cucumber harvest cucumbers Farming local foods Picking Pickles! One of the things I set out to do with this blog was to tell you about how different foods got from farm to table, or farm to fork, or farm to plate. 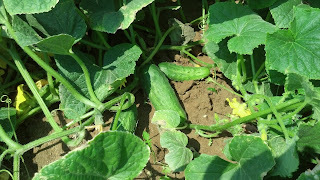 Last week, I took the opportunity to visit my friend Hannah who grows cucumbers to see what cucumber harvest was like and to spend some time looking at a major summer crop - cucumbers. Cucumbers ready for harvest on Hannah's farm! Hannah and I spent 2 years together on the LEAD Maryland program, a 2-year agricultural leaders fellowship. It was a great opportunity to see the vast diversity of Maryland farming operations and agriculture across our state from the Atlantic Ocean to the Appalachian Mountains. We even got to travel through Vietnam, Hong Kong, and Taiwan together as part of LEAD Maryland's international agriculture seminar. . But enough about that, today we're talking cukes! Hmmm, sounds like the title of a children's book doesnt it?! 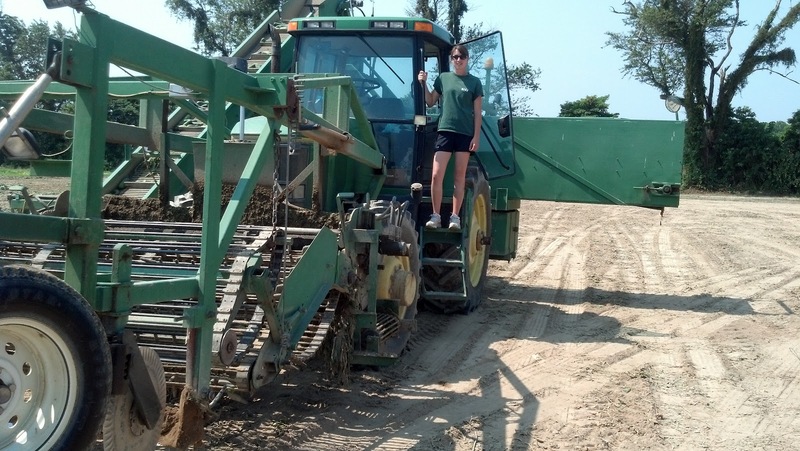 Hannah grows about 1000 acres of cucumbers each year. Because cucumbers have about a 45 day time period from when cukes are planted until they are ready for harvest, Hannah is able to double crop, meaning, planting and harvesting cukes twice, so it actually takes only 500 acres to grow 1000 acres worth of cukes. All of their cucumbers go for processing to local and regional pickling companies like B&G Foods in Hurlock, MD, Vlasic which has a processing facility in Delaware and Mount Olive which has a facility in Pennsylvania. Hannah's cukes are delivered to the processor by the tractor trailer load within hours of being picked and processed the same day. Cucumbers are highly perishable so they need to get where they are going and into the product they are being made to retain the highest quality. At the processors, they are placed onto sorting tables and graded and sorted by size to determine which pickle product those cucumbers will go toward. The cukes are made into various pickles if they make grade, and are processed into relish if they do not. She strives to grow pickle-grade cucumbers because she does not get paid for relish-grade cucumbers. Those are sort of deemed "seconds" and the farmer does not get paid for seconds. Click the arrow in the image below here to watch my video of Hannah's cucumber harvest! Keep in mind, here in the Mid-Atlantic, geographically speaking, the states are small, so Delaware is just a couples miles from both my farm and Hannah's farm. Likewise, the Pennsylvania state line is about 50 miles from my farm and maybe 75 for Hannah. If the common standard of 100 miles is used as a rule of thumb, "local" in the MidAtlantic region can include MD, DE, NJ, VA, and PA for many of our farms on the Eastern Shore. OK, back to cucumbers. 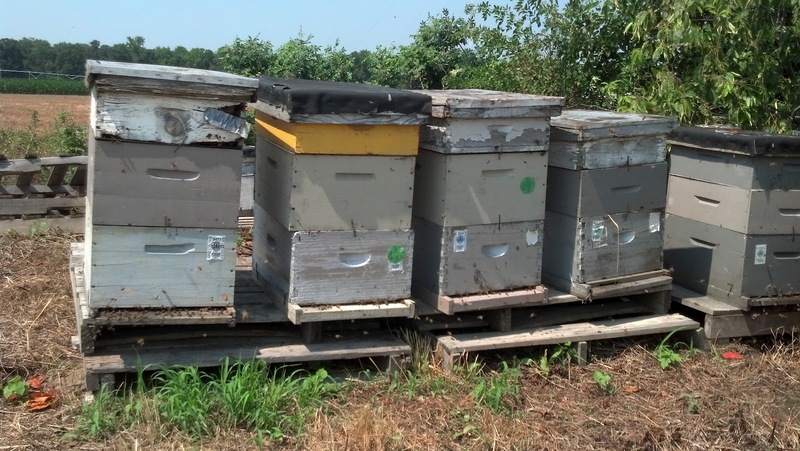 In several areas around the farm, Hannah keeps bee hives to help with the pollination of the cucumbers. 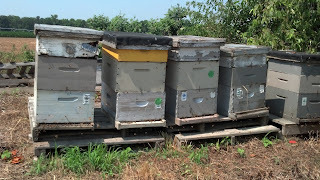 They lease bee hives from a bee keeper in Maryland who comes and delivers hives according to how many hives are needed and moves the hives around from field to field according to the bloom time for the cucumber variety. They need hundreds of thousands of bees to help pollinate their cucumber crop. This is just one of several sets of hives that surrounded the field she was harvesting the day I visited. They were busy bees that day so I tried to stay out of their way! Bee hives assisting with pollination. So cucumbers for pickling are all machine harvested. 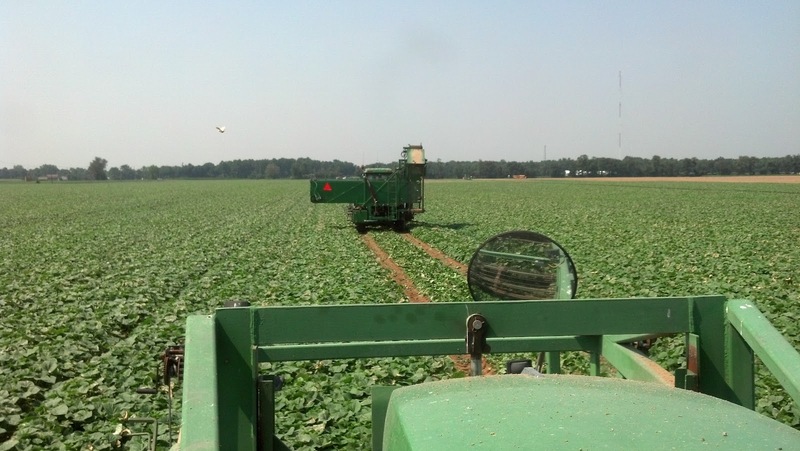 It takes each harvester about an hour to pick an acre of cucumbers. Its a slow process moving the harvester up and down the field, harvesting cucumbers then transfering them to a trailer to be hauled away. The day I visited, they had 4 harvesters running. All family plus one employee. Hannah, her dad, her brother, and one employee were all driving harvesters while their mom kept them all running with supplies and local truck drivers hauled their harvest to the processing facility. They also grow sweet corn, corn for grain, and soybeans in addition to cucumbers. It is truly a family farming operation. It was a Sunday and I had to smile when her Dad came over the radio and announced that since they were all in the field and not at church that morning, that church was coming to them and they had to come up with something to use for an offering plate! They like us, try to avoid working Sundays if at all possible. But if the buyer is open and has a crew on hand ready to process cucumbers, they harvest on Sundays! What a awesome sight! 100 acres of cucumbers being harvested! Like I said in my last blog about our green beans, Hannah and her family are another example of how the grocery store is full of LOCAL products. You just don't see the farmer's face on the jar of pickles. I can't say enough times that you as a consumer should never assume that because you don't "see" the farmer at the grocery store, you should not mistakenly assume that food came from far away or was imported. Hannah's cucumbers and my green beans and tomatoes are both examples of family farms selling to regional processing companies to make products like pickles, relish, salsa, spaghetti sauce, canned vegetables and who buy from local and regional farmers in season. 3. Mix water, vinegar and salt. Stir until salt dissolved. Pour over cucumbers. 4. Add extra dill, garlic, or cayenne pepper as desired. 5. Submerge pickles under water by placing a heavy plate on top weighted down by a jar full of water to be sure the cukes stay under the brine. 6. When a film appears, skim off and discard. 7. Taste test after 5 days. The cayenne pepper was my personal addition which I love. The salt could actually be reduced to 3/4 of a cup. The original recipe called for 1 - 1 1/2 cups. I used one cup and still thought it was too salty. My daughter and I started taste testing after only 48 hours in the brine and became addicted. What I like about this recipe is that it is a "no cook" recipe which doesn't soften the cucumbers. They should be refrigerated once they have reach a point where you do not want them fermenting any longer. You could probably can them into a boil bath to preserve them which I will probably do to half the batch since I have 2 - 5 gallon crocks! I plan to refrigerate some and can the rest. These cukes have been pickling away now for a week and we have been munching on them all along. Maybe I won't have any left to can by the end of the summer. So far, they are still nice and crunchy. I'm thinking crock pickles are the way to go. Thanks Hannah for sharing your farm with us!